As personal blogs allow for some self indulgence, I’m happy to mention report that I went rather well at uni this semester with three Distinctions and a High Distinction. Two of my subjects also kept back my work for ‘example’ use – the grasshopper which you would have seen and my Communication Strategy assignment which was a thematic thing (I worked on one about Housing – particularly in a collective context) – where you researched and established your own brief and from that produced various design outcomes. This is certainly an encouraging terms of gauging that it was a good decision to leave work alone for this last year and just pull a few extra unnecessary things off my plate. It’s also rather nice that the HD was from my Design and Business class where I had a particularly difficult group to work with and I full well feel I deserve every bit of it. 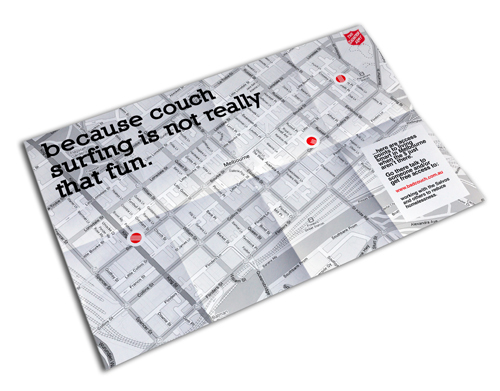 Above is some of the Communication Strategy stuff… my client was the Salvos, want to make VERY clear that it was and is just an assignment and has nothing really to do with them. 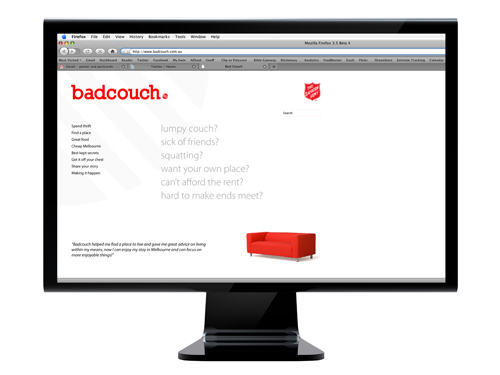 Badcouch doesn’t exist. However for the sake of something or other, like the rest of any work/photos/writing I put up on this blog it’s © Rebecca Matheson. (I confess although some of my ideas were quite thought out, lots of the Com Strat stuff happened fairly late in the assignment game so finnessing mightn’t have been quite up there, I was a little surprised at the Distinction, but he must’ve liked it or how it all fit together or something).